Montreal artist Nicole Jolicoeur exhibits a new work created for Presentation House Gallery. This work continues her research on the 19th century Parisian neurologist Jean-Martin Charcot and his theories on feminine "hysteria". The conception of this new work developed largely in response to the Gallery's selection of a second April exhibition, Masterpieces of Medical Photography. "My intention was to establish a dialectical relation with that exhibition by destabilizing the effect of truthfulness connected to photography (especially scientific photography) and by pointing up the fictional dimension at work both in the manipulation of photographs and in the constitution of theory" Nicole Jolicoeur. A catalogue was published by Presentation House Gallery in conjunction with the exhibition, with essays by Nicole Jolicoeur and Jeanne Randolph. 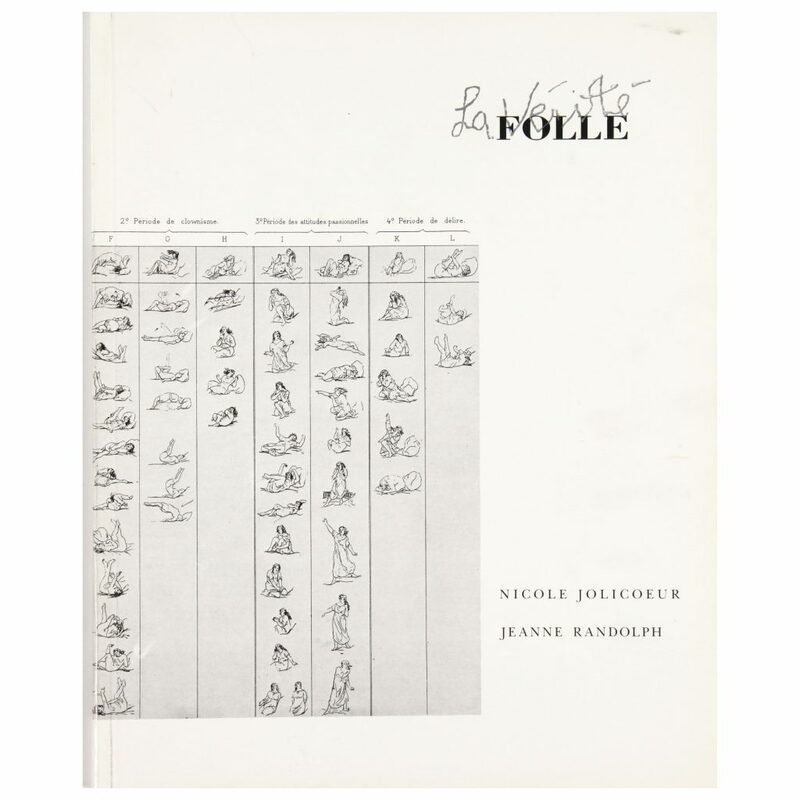 The 1990 gallery publication for La Verité Folle: Nicole Jolicoeur. The exhibition and publication presents work from her continuing research on the 19th century Parisian neurologist Jean-Martin Charcot and his theories on feminine "hysteria". The conception of this new work developed largely in response to the Gallery's selection of a second April exhibition, Masterpieces of Medical Photography. "My intention was to establish a dialectical relation with that exhibition by destabilizing the effect of truthfulness connected to photography (especially scientific photography) and by pointing up the fictional dimension at work both in the manipulation of photographs and in the constitution of theory" - Nicole Jolicoeur. Text by Jeanne Randolph. French translation by Susanne de Lotbiniére-Harwood. Designed by Francois Blais, printed by Presses Solidaires.